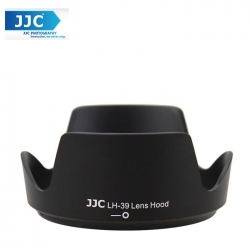 JJC LH-39 Lens hood is designed for Nikon AF-S DX NIKKOR 16-85mm f/3.5-5.6G ED VR Lens and Nikon AF-S DX NIKKOR 18-300mm f/3.5-6.3G ED VR Lens. Lens hoods are primarily designed to prevent unwanted stray light from entering the lens by extending and shading the end of the lens. In addition, since the end of the lens is extended, you also get the added benefit of some extra protection from accidental impact. This flower shape lens hood also takes the final image's shape and aspect ratio into account. It allows the lens hood to block stray light with the higher portions of the lens hood, while allowing more light into the corners of the image through the lowered portions of the hood. Most important, this hood is reversible to stay on lens when not in use. JJC LH-39 replaces Nikon HB-39 lens hood.